Release Date: First released in 1988; this edition released April 25, 1993. 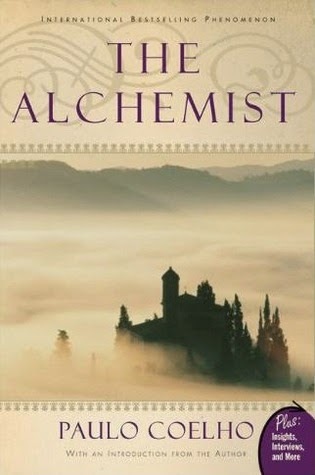 Book Cover: "Paulo Coelho's enchanting novel has inspired a devoted following around the world. This story, dazzling in its powerful simplicity and inspiring wisdom, is about an Andalusian shepherd boy named Santiago who travels from his homeland in Spain to the Egyptian desert in search of a treasure buried in the Pyramids. Along the way he meets a Gypsy woman, a man who calls himself king, and an alchemist, all of whom point Santiago in the direction of his quest. No one knows what the treasure is, or if Santiago will be able to surmount the obstacles along the way. But what starts out as a journey to find worldly goods turns into a discovery of the treasure found within. Lush, evocative, and deeply humane, the story of Santiago is an eternal testament to the transforming power of our dreams and the importance of listening to our hearts." Taryn's Review: I have heard rave reviews about this book for many years, but for some reason or another it never made its way onto my to-be-read list. I recently joined a book club and this was our first selection, so I was pretty excited to get started! I don't want to say that this book was disappointing or a letdown, but it wasn't rave-worthy in my opinion. It's a simple story and there was no doubt Coelho's strong religious background played a role in the themes throughout the book. I expected my world to be rocked, my perspective broadened, and a host of emotions to over my soul based on what others have told me about this book, but none of that happened. The lessons in the story are simple: be brave, follow your dreams, and obstacles may actually be teaching moments. The story focused on Santiago (also called the Boy) discovering his Personal Legend, along with the people he meets and the places he goes during his journey. Santiago could have lived his life being a shepherd, safely tucked away in the lands he knew so well, but the discoveries he made changed his life because he was courageous enough to venture into the unknowns. This was a sweet, simple, and short book, but not earth-shatteringly amazing for me. I don't think it is a "must-read" and I think there are far better books out there about finding oneself away from the comforts of the life he or she knows. Not disappointing, but not inspirational either.